Truly inspiring. I try to keep living everyday. New Zeland is on the list...and Japan. About moving...everyday, living, moving...falling and going up again. Wow, a really beautifully made video; Very inspiring thanks for sharing. i've made it a summer goal to make more short videos of my adventures. this inspires me to follow through. I love Japan... I've never been to Cambodia though, it's now moving up the list! This video is so beautiful as are your three points. I had no idea Cambodia was full of so much gorgeous natural beauty. My favorite places so far that I've traveled to are Vienna and Paris, but I've never been to an exotic and untouched place like this. Hopefully I will soon! Australia and New Zealand are so high up on my must-go-to-asap list! Talk about a great message. Thanks for sharing. ...love everything about it! the music, the message, the images and the way they are edited. Very uplifting! Thanks for sharing. Such an inspiring clip. I love film and documentaries...I really need to make that more of a priority in my life. 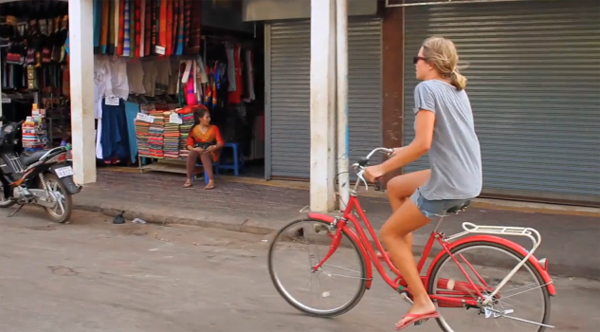 This clip makes me want to travel so badly! that's not Cambodia, it's Thailand. The Video is Thailand and nothing about Cambodia. The language/locations/font..etc. Hi Anonymous -- I was sharing what the author of the film stated. You can read it on the vimeo page of him and his girlfriend traveling through Thailand and Cambodia. Thanks for your comments!